Kamala Bay Terrace Resort sits on the shores of what has been called Phuket's most beautiful bay. There's extraordinary peace here. The hills rise around as if protecting it from the outside world. The sea presents a wonderful collection of colour from clear turquoise to deeper mysterious hues of blue. Amidst all this beauty you discover the terraces of the Kamala Bay Resort, 123 rooms and suites rise gently from the beach into the hillside. 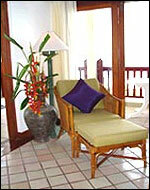 Every room has uninterupted views across the Andaman Sea. 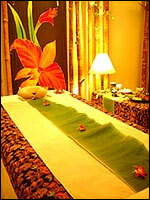 The decor is superb restrained elegant and supremely comfortable. - Free use of Water Sport Equipment at hotel Beach Club e.g. Windsurf, Canoe, Sailing board, etc. - Family Plan : Family of 2 adults and 2 children will be upgraded to Junior Suite for only Baht 2,000 per night with one extra bed and complimentary ABF for the second child. - Check-in time : 14:00 hrs. & Check-out time : 12:00 noon. Room used from 12:00 noon to 18:00 hrs. on the day of departure will be charged at 50% of the room rate. - Any no-show will be charged for 2 nights stay except in Peak season (21 Dec 04-10 Jan 05) which will be charged 5 nights. 101 Deluxe Rooms: King size bed or twin beds and balcony with views of the Andaman Sea. 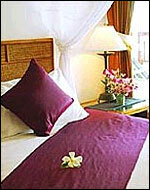 - Deluxe King bed rooms (50) - 39 sq.m. - Deluxe Twin bed rooms (53) - 48 sq.m. 17 Junior Suites: Bedroom, living room and balcony with views of the Andaman Sea. - Junior Suite King bed rooms (16) - 50 sq.m. - Junior Suite Twin bed rooms (2) - 50 sq.m. 5 Executive Suites - 57 sq.m : Bedroom with king size bed; living room with wet bar; luxurious bathroom with Jacuzzi tub/shower and bidet; and two balconies with view of the Andaman Sea. Notes : Non-smoking rooms also available on request. The place to be for romantic dining. Attentive staff will serve your choice from a wide array of Thai and Western cuisine. Try the theme buffets such as the Thai night with traditional dances and music, or sip cocktails on the verandah and enjoy our resident brand. Casual, open air restaurant for breakfast, lunch, tea and dinner. Thai and Continental Cuisines. Smart casual, air conditioned restaurant Featuring Western Thai Cuisine with tropical flair Especially romantic. 24 Hours everyday. Served on your room's private balcony overlooking the Andaman Sea. Poolside next to our waterfall for lunch, snacks, tea, & cool drinks In a very relaxed atmosphere while enjoying our waterfall and the pool. Casual, comfortable setting among our lilly ponds. With views of the sunsets and the Andaman Sea. Speciality cocktails, tall cool drinks, snacks, and live music. Center stage, open air, under the stars and in the moonlight live entertainment, Thai cultural Shows and displays. For after-dinner drinks & scrumptious desserts, Outdoor BBQ's and Buffets. Opening Time : Open daily from only 09.30 am. - 05.30 pm. Three air conditioned meeting rooms, which can be opened into one large room. Capacity up to 90 people. Full complement of audio/visual equipment. Special F&B Menus, Coffee Breaks, Theme Parties, & more. Our pool side and beach club snack menu is available everyday until 06.00pm Don't forget our Happy Hour at the Papillon Cocktail Lounge from 06.00 pm. - 08.00 pm. - Private Beach : just only 5 mins to the Hotel's Beach Club. - The hotel provides daily shuttle service starts from 09.00 a.m. till 06.30 p.m. for every half-hour. A variety of watersports are available every day (weather permitting) e.g. Wind Surf, Laser, Sea Canoe, Body Boards, snorkel trips and Scuba diving. Food and Beverage facilities are also available at the Beach Club. - Fitness centre : First Class, air conditioned Fitness Centre with a large selection of weights and equipment.